Iran is spreading lies on social media. There’s an easy way to stop them. Decision marks first time an element of a foreign state has been officially designated terrorist entity. 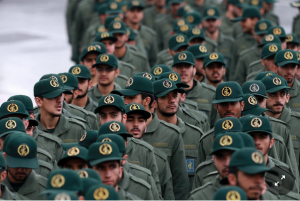 The Trump administration escalated a pressure campaign against Iran on Monday by designating the country’s Islamic Revolutionary Guard Corps as a foreign terrorist organization, the first time an element of a foreign state has been officially named a terrorist entity. “This action will significantly expand the scope and scale of our maximum pressure on the Iranian regime,” President Trump said in a statement Monday. “If you are doing business with the IRGC, you will be bankrolling terrorism.” The designation aims to squeeze the IRGC’s financial resources and shrink its military presence in the Middle East, helping the U.S. crack down on businesses in Europe and elsewhere controlled by the organization. Iran retaliated against the U.S. move by designating the U.S. Central Command, which is responsible for military operations in the Middle East and Afghanistan, as a terrorist group. “Any unusual move by them will be assessed as the behavior of a terrorist group, and dealt with by a reciprocal move,” said a spokesman for Iran’s Supreme National Security Council, which made the terror designation on Monday. Supremes Should’ve Ruled 9-0 for Trump’s Travel Ban!